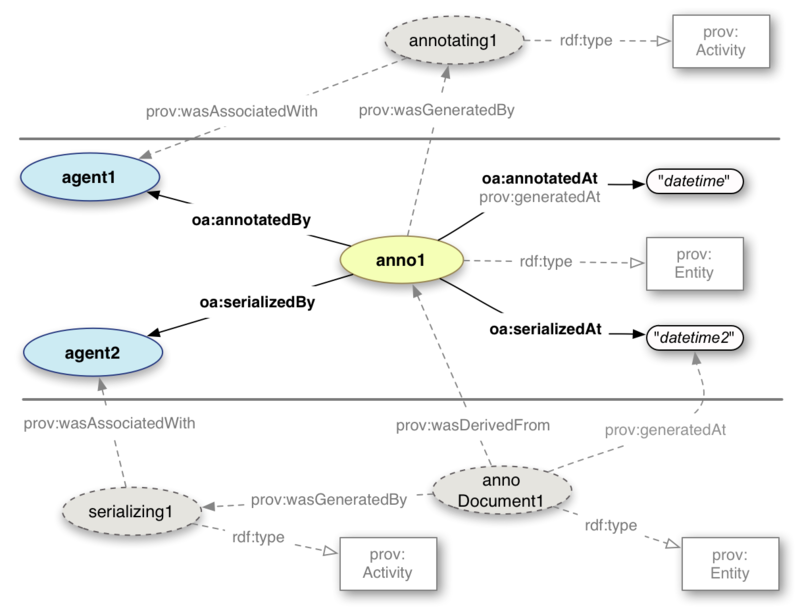 The Open Annotation data model specifies a very simple method of expressing the provenance of an Annotation. This is able to be mapped into the richer and more complex W3C PROV model. The PROV model is expressed in terms of Activities and Entities consumed or produced by those Activities. There are two Entities in the Open Annotation model, which for expediency and simplicity are collapsed into just oa:Annotation. These are the Annotation document, and the concept that the Annotation embodies or describes. This is the distinction between oa:annotatedBy and oa:annotatedAt, versus oa:serializedBy and oa:serializedAt. In the PROV model we have to split these apart again. We use the oa:Annotation for the concept, and thus still require an Annotation document. There are also two Activities, Annotating and Serializing, which produce these Entities. In this case, Annotating is the process of annotating a resource, and should not be confused or conflated with the Motivation of the same name. Serializing is the process by which the Annotation Document is created. The Annotation document is derived from the concept, which necessarily comes first. The concept was produced as the outcome of the Annotating process, which was performed by an Agent, the object of oa:annotatedBy. The Annotation document was produced as the outcome of the Serializing process, which was also performed by an Agent, the object of oa:serializedBy. Both of these processes happened at a particular point in time, oa:annotatedAt and oa:serializedAt, respectively. Although the list of Motivations in the specification is derived from an extensive survey of the annotation landscape, there are many situations where more exact definitions of Motivation are required or desirable. In these cases it is RECOMMENDED to create a new Motivation resource and relate it to one or more that already exist. New Motivations MUST be instances of oa:Motivation, which is a subClass of skos:Concept. The skos:broader relationship SHOULD be asserted between the new Motivation and at least one existing Motivation, if there are any that are broader in scope. 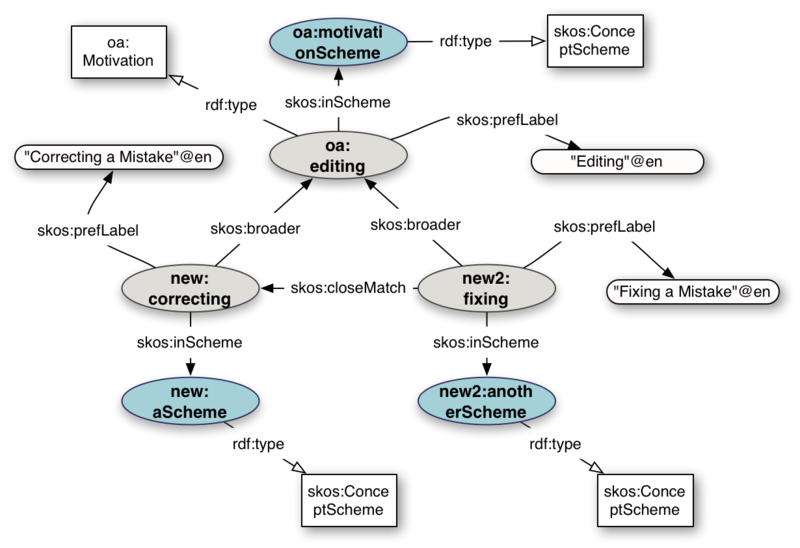 Other relationships, such as skos:relatedMatch, skos:exactMatch and skos:closeMatch, SHOULD also be asserted to concepts created by other communities. skos:prefLabel "Correcting a Mistake"@en . skos:prefLabel "Fixing a Mistake"@en . Representing Content in RDF 1.0, Koch, J. Velasco, C. 10 May 2011. Cascading Style Sheets Level 2 Revision 1 (CSS 2.1) Specification, Bos, B. et al. 7 June 2011. Dublin Core Metadata Elements, DCMI Recommendation, 14 June 2012. DCMI Metadata Terms, DCMI Usage Board, 14 June 2012. DCMI Type Vocabulary, DCMI Usage Board, 14 June 2012. Document Object Model (DOM) Level 3 Core Specification, Le Hors, A et al. 7 April 2004. FOAF Vocabulary Specification 0.91, D. Brickley, L. Miller. 9 August 2010. Best Practices for Fragment Identifiers and Media Type Definitions, Tennison, J. 25 October 2012. HTML5, Berjon R. et al. 17 December 2012. JSON-LD Syntax 1.0, Sporny, M. et al. 12 July 2012. Memento: Time Travel for the Web, H. Van de Sompel, M. Nelson, R. Sanderson. October 2010. PROV-Overview, Groth, P. Moreau, L., 11 December 2012. RDF 1.1 Concepts and Abstract Syntax, Cyganiak, R., Wood, D., 15 January 2013. RDFa Core 1.1, Adida, B. et al. 7 June 2012. The 'application/pdf' Media Type, Taft, E. et al. May 2004. XML Media Types, Murata, M. St. Laurent, S., Kohn, D. January 2001.
application/rdf+xml Media Type Registration, Swartz, A. September 2004. URI Fragment Identifiers for the text/plain Media Type, Wilde, E., Duerst, M. April 2008. Named Graphs, Semantic Web Interest Group, March 2004. The editors would like to acknowledge the financial support of the Andrew W. Mellon Foundation for the Open Annotation Collaboration and funding the initial reconcilliation between the Annotation Ontology and Open Annotation Collaboration models.